Salesforce Classic is Dead – Get Over It! There, I said it. I know many of you have been thinking it as well as the writing has been on the wall since Dreamforce. Did you not see the signs along the way? Salesforce even revamped their product lineup for the first time in over a decade to the new "Lightning Editions"
So does this mean we can believe the hype and we now live in a world that doesn’t need Salesforce Classic? Though the marketing from Salesforce tells you otherwise (queue the super slick high production video! ), we’re certainly not there yet. We still have a feature gap, but we know that will continue to close with time and each new release. 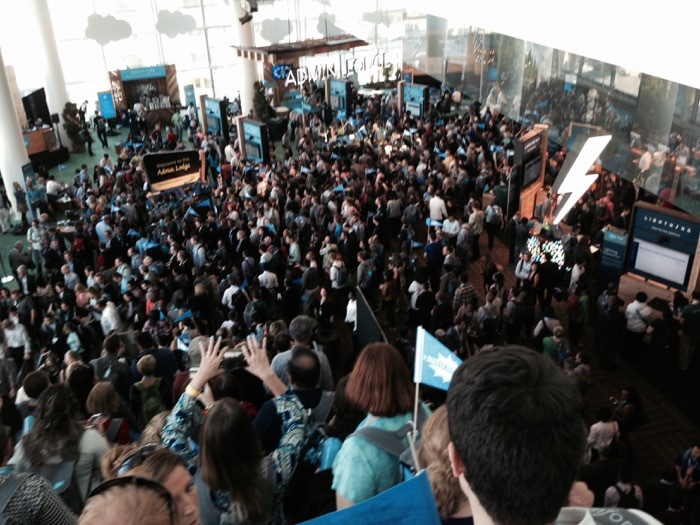 It’s a Dreamforce Lightning Party! Lightning was officially announced just prior to Dreamforce, and for those attending the conference, you couldn’t miss it. So, was Lightning ready for the masses? Absolutely. Last summer before Dreamforce I had a chance to do some usability testing on Lightning and met with members of the product team. During that visit one nugget I found fascinating was how many Salesforce customers could start using Lightning immediately. I won’t tell you the number, but it made me realize there must be a lot of small and medium businesses that have bought Salesforce over the last 15 years that are still using it close to "out of the box." As someone who is probably in the top "1%" of Salesforce users (and therefore someone who can’t fathom not using advanced features), it did make me pause and take perspective. At Dreamforce Lighting hit with a bang (pun intended). As long as you stayed on the "happy path" and didn’t stray off script, it demonstrated well on the big screen. It had plenty of "sizzle" – resizable and fresh dashboards, Opportunity Kanban, Sales Path, etc. Of course immediately after the Lightning Dreamforce party came the "hangover release" (I didn’t make that term up by the way) – and each release thereafter continues to chip away at the feature gap to Classic. 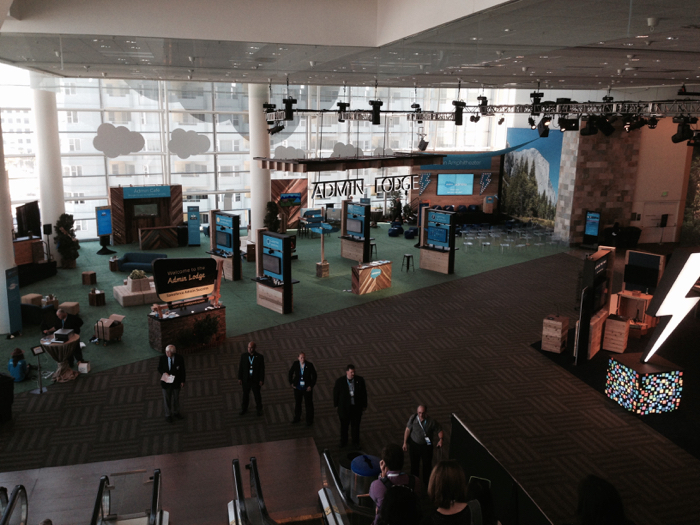 Now that the Dreamforce Party is over, do I use Lightning or Classic? We are now up to the Summer 16 Release. Can small and medium businesses make the jump Lightning? Personally I think this will come down to the System Administrator and the complexity of the org. There are a lot of Salesforce Administrators out there that can make us proud. They know their stuff, they test, they’re plugged into the community, and they’re not afraid to try new things. These trailblazers are the ones most likely to get small and medium businesses up and running on Lightning. If their org can handle it, these Admins have the technical stewardship to make it happen. What about companies that don’t have a strong Salesforce Administrator? Every now and then we stumble onto a Salesforce customer that is stuck in the past. Like some lost Amazon tribe sequestered deep in the jungle, they never enabled Chatter and Global Search, and still have the old six step report wizard. Like fire from a match, they’ll never know how to turn on Lightning and will keep plodding along entering their contacts into Salesforce like the salesperson did before them. Unless another company acquires their part of the rainforest, they’ll probably remain on Classic and frozen in time. What about enterprise customers? These will surely be the slowest to adopt Lightning, and perhaps never will. They will have the biggest functionality gap, the most legacy code to rewrite and test, a lot of end-users to train, and most likely too many custom objects to work well in Lightning (I still contend that Classic handles on-screen real estate much better than Lightning, especially if you have more than three custom objects, but I’ll save that rant for another blog post). One thing I see with enterprise customers is that flashy new projects that promise to generate revenue get budget, and cleaning up a legacy mess rarely gets funding. If the Lightning User Interface (UI) doesn’t add any business value (i.e. revenue), I suspect enterprise customers will plod steadily along with Classic and forego the slick new features. What if I’m buying Salesforce today, do I start with Lighting or Classic? The simple answer is, and one we we tell our clients, let the requirements of your project drive which UI you should use. If you can’t work through your entire business process in one user interface, you probably should stay in Classic rather that losing productive time flipping back and forth. That being said, you could have a scenario where part of the company is working in Classic and some departments can get by in Lightning. So what’s the real adoption? 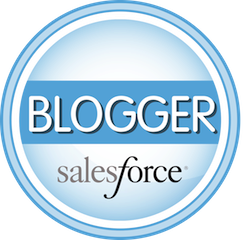 Only Salesforce can tell us – all I have is anecdotal evidence. At a recent Salesforce user group meeting a few months back with about 60 people in attendance, less than ten said they were testing the Lightning UI, and only one or two said they had users live in Lightning (as an update, when surveyed at the June 24, 2016 Dallas User Group meeting, not a single attendee admitted to having users live in Lightning). 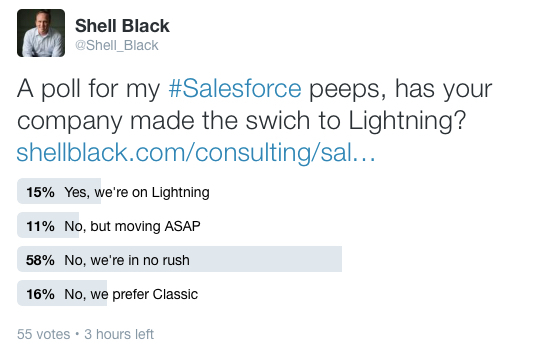 There was a Lightning poll in the Salesforce Community back in March of just over 100 responses (results below). My guess is that as we get more and more new features that are tied only to Lightning and the feature gap to Classic closes, adoption will march steadily forward. There is also a growing beachhead of small businesses that have signed on with Salesforce since Dreamforce that started with Lightning. That’s the demo they saw when they made the purchase, their org was enabled with it from the start and therefore they’ve never seen Classic. This group of users will be the "Lightning Generation"- a generation that has never seen the old UI. As a member of Generation X and someone who has been consulting on Salesforce since 2005, I still have a hard time accepting the writing on the wall – but mark my words, Salesforce Classic is dead. Email going out to customers early May 2018. Looks like Salesforce took Classic out back and finally shot it…. dead. 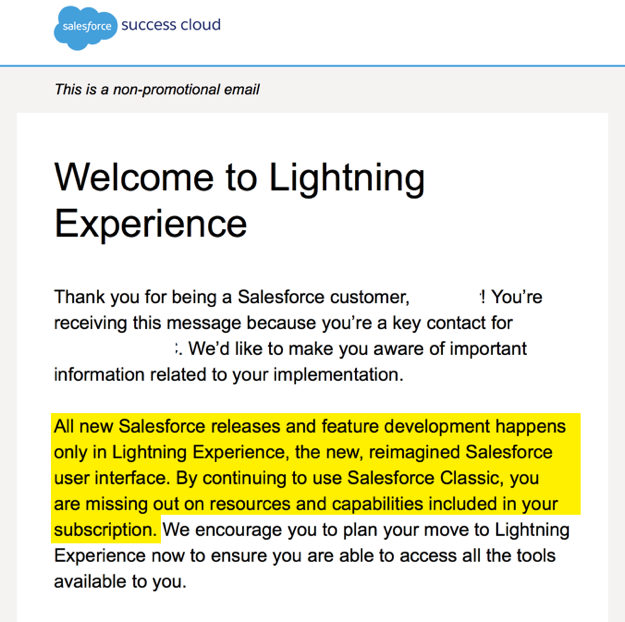 As of 8/10/2018, Salesforce has begun forcing their customers to migrate to the Lightning Experience. Salesforce is "Auto-Transitioning" some customers to the Lightning Experience, and only giving them 21 days to prepare. Salesforce is not giving them a choice. Customers that are impacted can make a plea to delay the transition, but it does not appear that it can be stopped. There has not been any transparency on how customers are being selected. I know of at least one case of a customer using a feature only available in Classic (mail merge) that is being forced to transition.